An excellent day in the mountains with a bunch of new friends. Mount Saint Helens is located in southwest Washington, and is of course famous for its massive volcanic eruption in May 1980. The eruption blew off over 1300 vertical feet of mass and a large portion of the north side of the volcano. 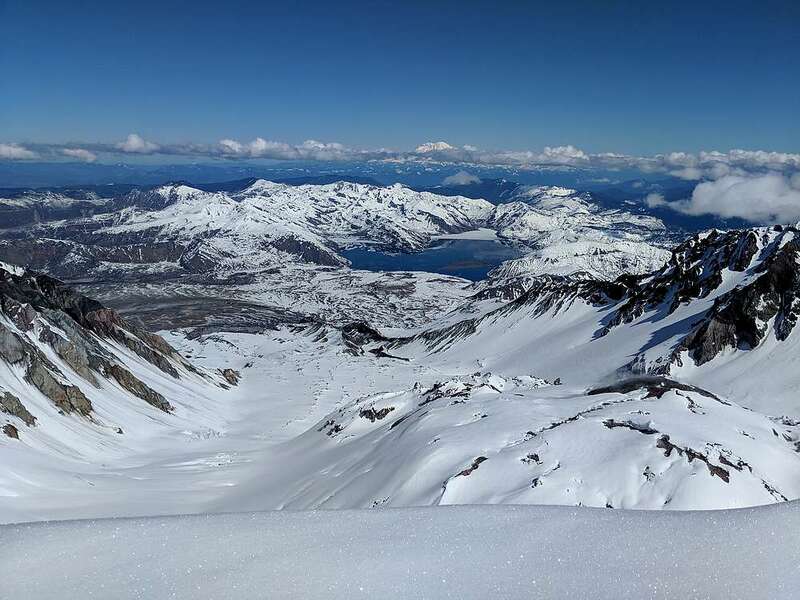 Thanks to generally low avalanche risk, a long winter ascent is possible up the “Worm Flows / Swift Glacier” route on the south face, starting at Marble Mountain SnoPark. Michael and I drove to Brian’s house on Friday, and then got up early Saturday morning to drive to the trailhead. It was a total zoo! 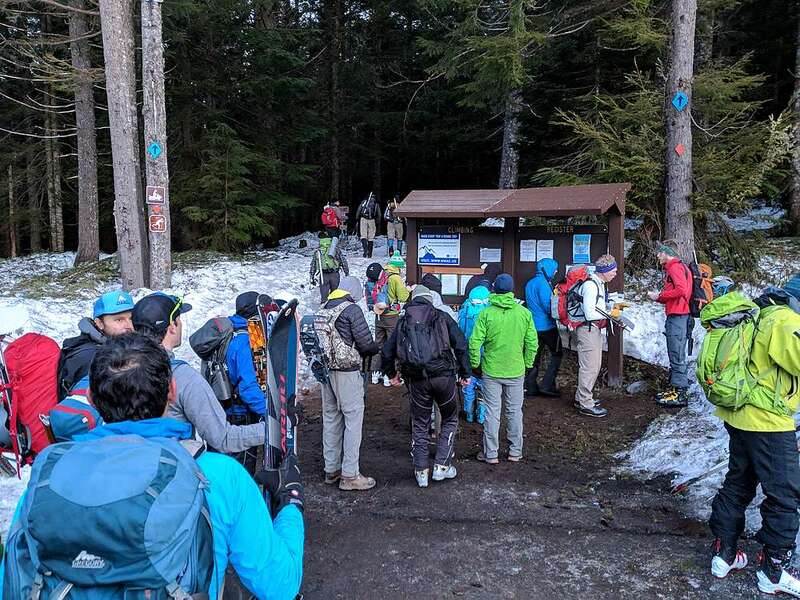 With a nice weather forecast, and the final weekend before the April 1st permit season begins, people where everywhere, including a long line at the trailhead register to sign in. The trail was well used and packed, and we wound our way through the trees until reaching Chocolate Falls. It was a good spot to lather up with sunscreen and enjoy our first good views of the mountain, including strings of climbers making their way up. The weather was sunny and beautiful. 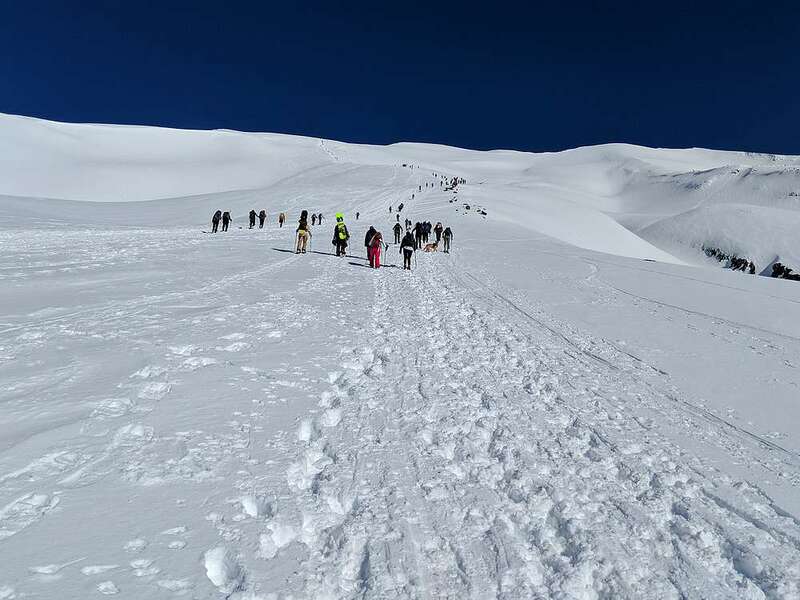 We continued up the mountain, donning our crampons to climb a gully as most of the others climbers stayed on a ridge. Up and up we went, surrounded by literally hundreds of other folks out enjoying the perfect conditions. It was a long climb, but Michael set a good steady pace for us and Brian entertained us with conversation and history. Once at the edge of the crater, we left most of the people and traversed west along the ridge to the true summit, and even had it to ourselves for a few minutes. Looking over the edge to the north, it was amazing how much earth had been displaced by the 1980 eruption. Definitely awe inspiring. After a PB&J and milk chocolate Milano’s from Brian, it was time the head back. After retracing or steps back to the main lunch spot, we got there just in time to see a couple folks paraglide down the south slopes. It was a surreal scene for this Idahoan used to summit solitude. Next up was some amazing glissading down the slopes we’d climbed earlier. All in all, I’d say we glissaded over 4000’ feet, which was a blast and also saved some wear and tear on aging knees. We were all smiling from ear to ear throughout the descent. It was an amazing day in the mountains. Perfect weather, fantastic views, and plenty of good company. We covered the 11 miles and nearly 6000’ of elevation gain in 8 hours round trip. Now all that was left was the drive home to Boise. I promptly fell asleep happy just after midnight. 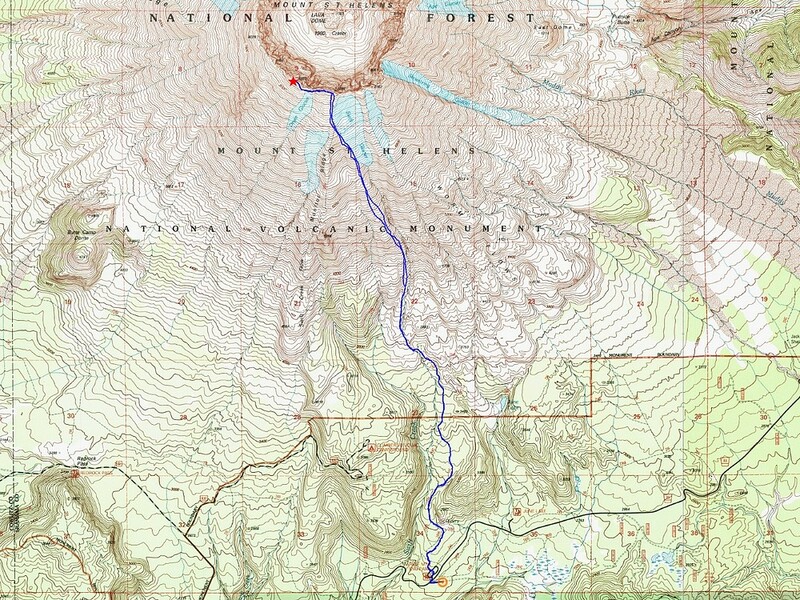 Map of the route, 11 miles and 5900' gain round trip. Waiting in line to sign in at the trailhead! First good view of the mountain from Chocolate Falls. Early in the climb, Mount Hood in the distance. Michael and Brian telling stories on the way up. View across to Mount Adams. Climbing the stairs, someone else sliding down. Quite the string of people behind us. Nearing the crater rim of Mount Saint Helens. 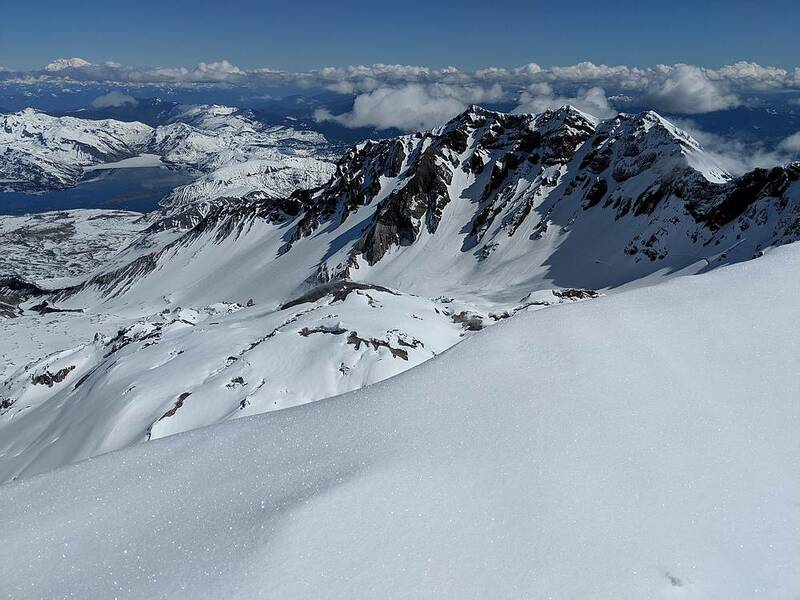 View toward the summit of Mount Saint Helens. Victory shot on the summit. Steam coming from the bulge in the crater. View of Mount Rainier to the north. Some amazing glissading on the way down. Map of the route, 11 miles and 5900' gain round trip.Waiting in line to sign in at the trailhead!First good view of the mountain from Chocolate Falls.Early in the climb, Mount Hood in the distance.A few other folks on the climb with us…Michael and Brian telling stories on the way up.View across to Mount Adams.Climbing the stairs, someone else sliding down.Quite the string of people behind us.Nearing the crater rim of Mount Saint Helens.View toward the summit of Mount Saint Helens.Victory shot on the summit.Steam coming from the bulge in the crater.View of Mount Rainier to the north.Some amazing glissading on the way down.